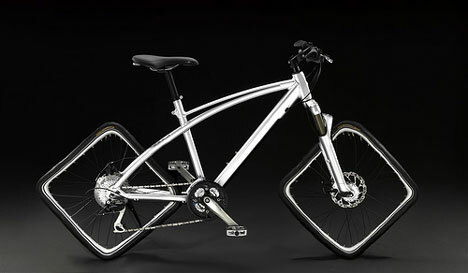 Since bicycles work pretty flawlessly as it is, you might wonder just why we need crazy modifications like spokeless wheels and the ability to ride sideways. 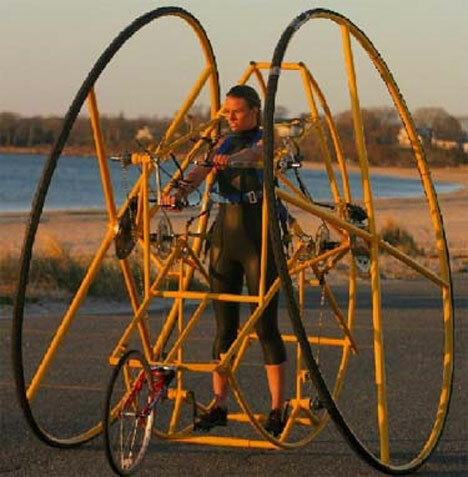 Innovation never ceases, and as a result we’ve been treated to a wild assortment of ideas from giant amphibious contraptions to bikes that fold up into backpacks. 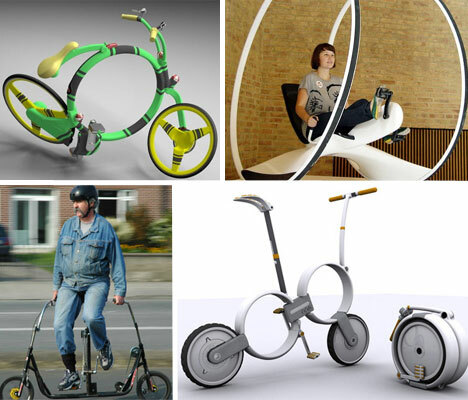 Some of these 15 concept bikes address issues like cost, portability and adaptability and others are just plain strange. You’d definitely give this thing a second look if you saw it gliding down the street past you… and straight into a lake. 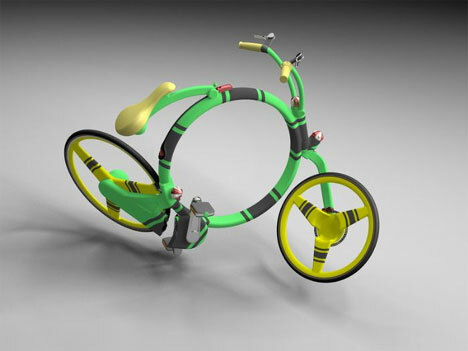 The Di-Cycle concept bicycle is amphibious and was designed specifically for the Dutch city of Helmond to allow residents a smooth transition between land and water travel. Holland would have to construct entire parking garages for these gargantuan things if they were to actually catch on. 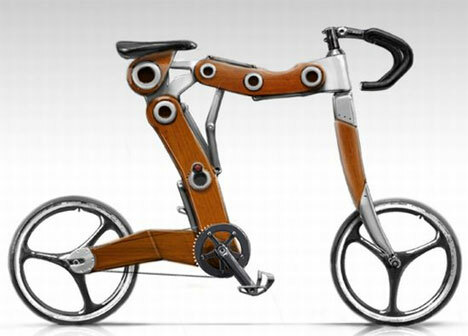 This folding bicycle by Thomas Owen has a futuristic-looking design that compacts into an incredibly small package. 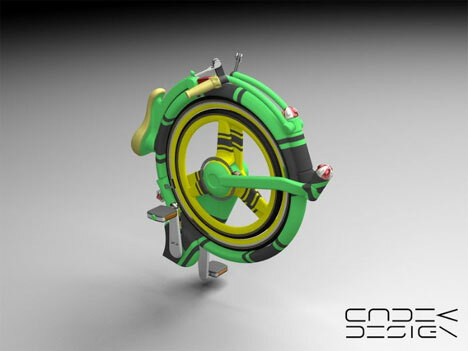 It’s meant to make bicycle transport in urban environments easier by creating a super-portable bike that can go practically anywhere. It’s difficult to tell from the images of this concept, however, exactly how it works. Riding a bike facing forward is boring. 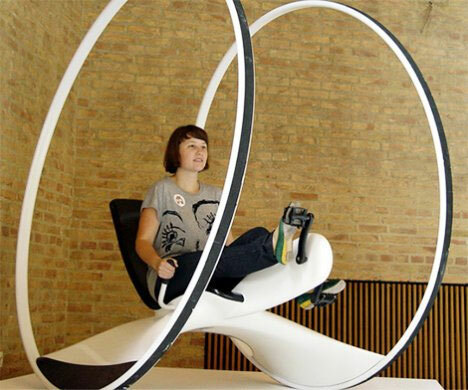 Or at least, so says Michael Killian, the software engineer who decided that what the world needs is a sideways bicycle that uses the same body movements as a snowboard. It has a unicycle seat and little handlebars on either side. It’s not for everyone – Killian says only 6 out of 10 people are able to master it. 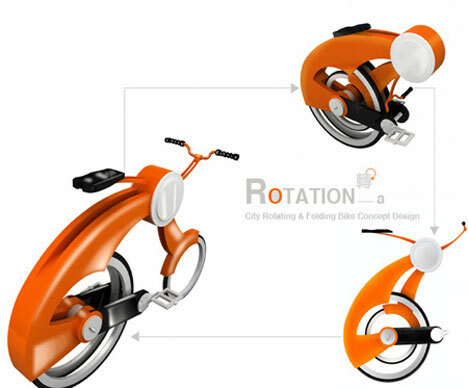 The ‘Rotation’ city rotating & folding bicycle design by Yirong Yang is fully adjustable, so you can determine the best position for the handlebars, saddle and distance between the front & rear wheels. 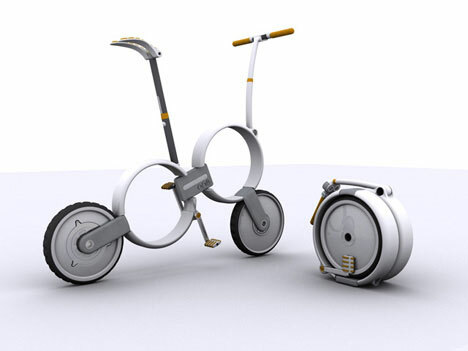 It’s also two different vehicles in one – it can be used as a bicycle or unicycle – and folds up after use. Space comes at a premium, and with a world population that is rapidly multiplying by the day, it’ll only get worse as the years pass. That explains why so many bicycle designers are creating concepts that are getting increasingly more compact. The ‘Locust’ concept by Josef Cadek features parts that fold neatly into a circular central frame. Such a design makes it ideal for bringing it onto trains and buses. 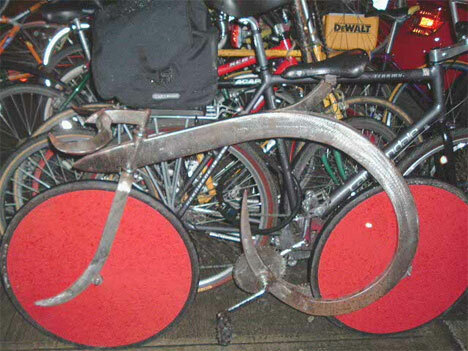 If Vikings had come up with the concept of bicycles, their design might have looked a little something like this. Like something straight from a medieval blacksmith’s studio, this handmade steel monster has a scythe-like body and opaque red wheels. It was spotted by Green Mountain Bikes in downtown Seattle. Let’s say you don’t want to sit down for some reason. Perhaps you’re restless, or you’ve got a raging case of hemorrhoids. No worries: there’s a bicycle for you, too. 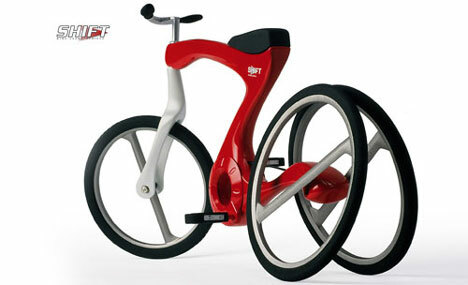 The bizarre ‘Hyper Bike’ by Body Rite Ltd is supposed to decrease the rider’s vulnerability on the road by offering more stability and balance. The rider has to use a total-body climbing, swimming motion to propel it forward. Good exercise, if nothing else. 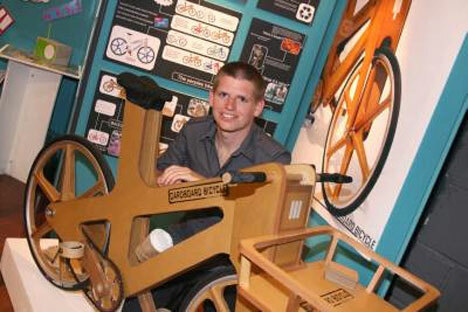 Who better to create a sort of retro-looking wooden tandem bicycle than a timber technology student? Jens Eichler made what he calls the ‘Renovatia’ by cutting, gluing and sanding sheets of beech plywood until he achieved the curvy, organic shape he was going for. 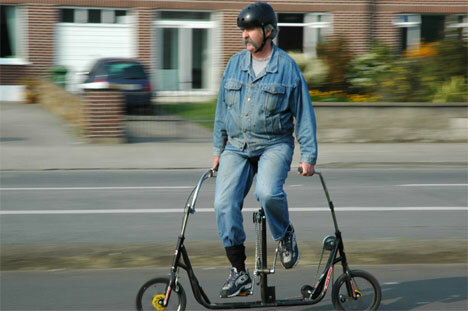 No word on how much heavier a bike like this would be than one made from more conventional materials. 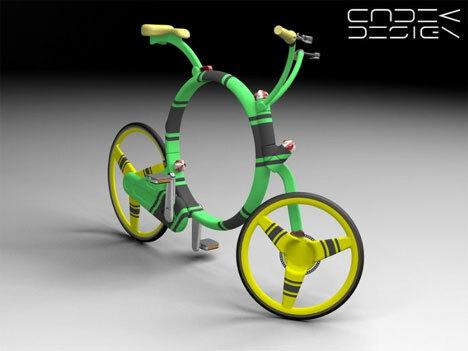 With a design that oddly resembles a person on their hands and knees, the Versabike is fully adjustable so anyone can configure it to their own specific needs. That means it can be shared by multiple people, and can grow with a child. The eco-friendly design has recyclable parts and can expand out or contract while in motion. Its shape calls to mind the classic three-wheelers of yore, but the Shift has modern style as well as function. 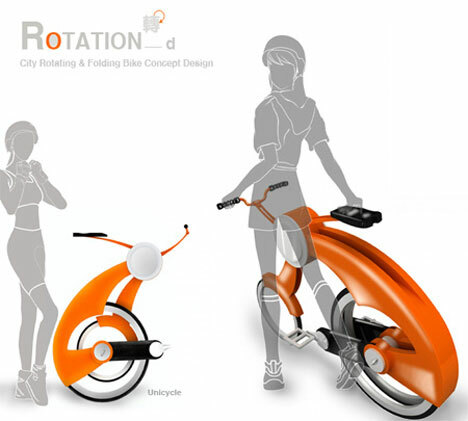 The tilting rear wheels help balance the bike at slow speeds. The wheels shift inward as the child builds up momentum, causing the balance to gradually shift from the bike to the child. That makes the transition to a traditional two-wheeled bicycle a little easier. As a cyclist, sometimes you really wish it were easier to keep your bicycle with you throughout the day, through bus rides, at the store or at the office. 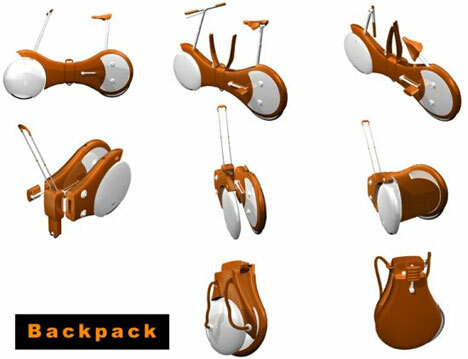 Chang Ting Jen’s entry into the International Bicycle Design Competition recognizes that need, offering a bicycle that easily folds up to be worn as a backpack. It’s made of plastic and weighs 5.5kg, and even turns into a handcart. 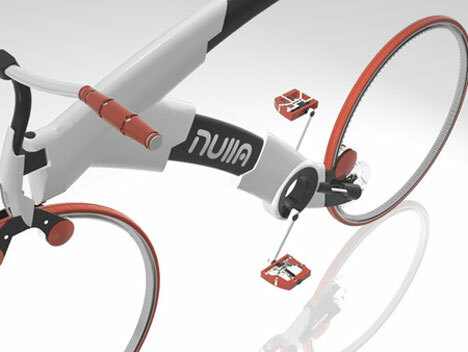 This bicycle might just have the tiniest wheels you’ve ever seen. It’s made that way for both light weight and the ability to fold it into an amazingly small package. 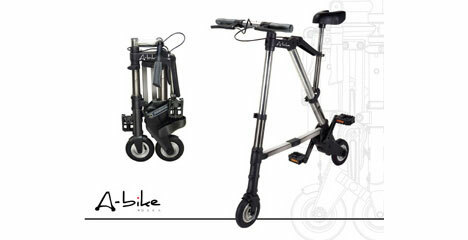 The A-Bike weighs just 5.5kg, and it takes just 10 seconds to fold and unfold it thanks to quick-release clamps. Despite the small wheels, it can attain normal speeds without having to pedal any faster than with an average large-wheel bike. This bicycle is waterproof, lightweight and only costs $30. It’s also fully recyclable, thanks to its almost 100% cardboard construction. 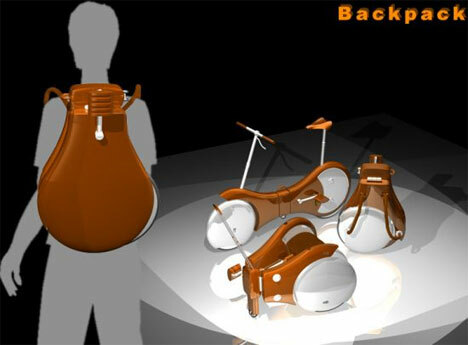 Product design student Phil Bridge created it as a low-cost, eco-friendly option that can be easily mass produced. 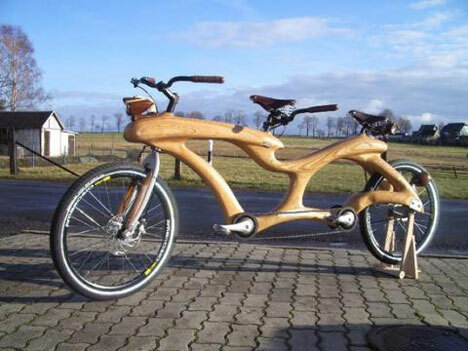 It’s not the nicest-looking bicycle ever, and it’s not exactly a performance bicycle either. At least you won’t have to worry about anyone stealing it. 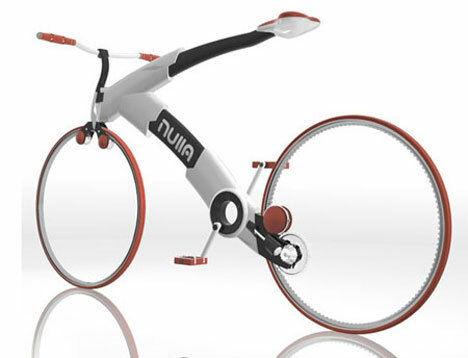 If you’re the type of person for whom minimalism is the gold standard of design, you’ll love the Nulla spokeless bicycle, which doesn’t have a central hub or a chain-drive. The seat juts out disconcertingly from the frame and the wheels seem a bit flimsy, but it sure is stylish. 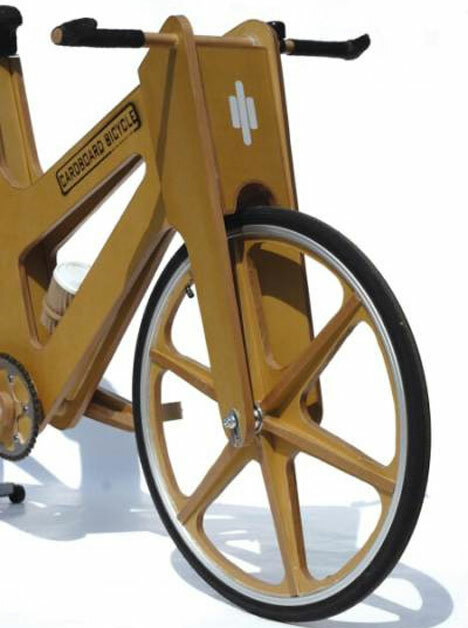 Square wheel seems like a contradiction in terms, but this bicycle rides more smoothly than you might think. The secret is the shape of the road over which the wheels roll. The wheels can keep the bike moving in a straight line and at a constant velocity as long as it’s traveling over evenly spaced bumps of just the right shape, called an ‘inverted catenary’.